A digital installation that seamlessly integrates architecture and space, transporting employees to an environment in tune with nature. Microsoft enlisted the help of Gensler and Digital Kitchen to reimagine lobby spaces inside two atriums of their headquarters campus. 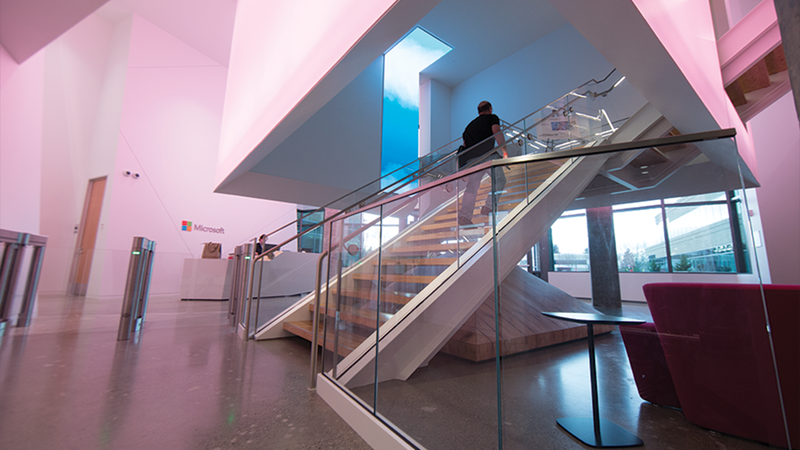 Gensler’s architectural solution introduced lit cube elements that can be seen/experienced from outside the buildings but are also functionally integrated into stairways. People travel through the inside of the cubes to move between floors. Digital Kitchen concepted four layers of natural environments or “strata” to bring to life inside the cubes. Each strata – water, forest, flocking birds and clouds – has a unique formal quality, such as color, shape, motion and sound.